Scalp problems are any irritation or disease of the skin on the head, excluding the face and neck. It is not a single condition but rather a broad term for various different types of diseases of the skin on the scalp. However, many cases of scalp problems are due to issues with hygiene and the use of hair care products rather than being associated with skin diseases. This is largely due to the desire to have certain hairstyles, dye the hair different colors and create the appearance of a healthy head of hair. Simply avoiding these aesthetic practices could prevent many of the common scalp problems. Often in these instances the focus of any treatment should be on implementing good hygienic practices and limiting the use of hair care products which allows the condition to resolve completely without the need for any medication. The human scalp is the top and back part of the head, including a small area on the sides, which is bordered by the face in the front and neck at the back. Commonly, most people refer to the scalp as the head, although it is only one part of the head and the area where the most amount of hair grows. Scalp rash, pimples, blisters or boils. Sometimes there may be tingling or numbness on the scalp or swelling underneath the skin. These problems are not limited to any specific age group, gender or with a specific length of hair. One of the common complications of skin problems on the scalp is that it eventually leads to hair loss. In these instances, hair loss is not a symptom of the main disorder but rather occurs as a complication of the disease progressing or not seeking treatment in time. There are various causes of scalp problems which may present with different symptoms. It may be due to localized conditions involving the skin and hair on the scalp or may sometimes arise systemically and can simultaneously occur on other parts of the body. Identifying the most likely cause and implementing the appropriate treatment requires the professional guidance of a dermatologist and even a trichologist at times. However, many of the most common causes of scalp problems are due to simple lifestyle factors that can easily be remedied without professional medical attention. As with skin on any part of the body, the scalp needs to be washed frequently. The hair traps extensive dust and dirt from the environment, which coupled with the natural oils of the hair, can accumulate on the scalp and cause localized irritation. Hair care products such hair oils and styling gel which should be washed off on a regular basis may also be a problem. Repeated irritation and scratching may cause tiny breaks in the skin which increases the chances of an infection. Excessive use of hair care products such as hair oils and styling gel can remain trapped on the skin especially when it is not removed by regular washing. Shampoos, conditioners, hair relaxers/straighteners and hair dyes are other hair care products that may also cause a problem. These substances can cause irritant contact dermatitis where the skin becomes red, inflamed and itchy due to exposure to these substances. Some individual are hypersensitive and immune reactions may be triggered when exposed to these hair care products. This is known as allergic contact dermatitis. This video on hair dye allergies was produced by the Health Hype team. These conditions have been discussed in greater detail within this article. Dryness of the skin on the scalp is one of the common problems. It arises with age, dry climates, washing the hair too frequently and overuse of harsh hair care products that strips the scalp of its natural oils. Some people are more prone to dry skin than others and individual tolerance to climatic and hair care products also needs to be taken into account. Dryness of the skin is itchy and increases the chances of secondary infections arising at the site. Certain skin diseases like psoriasis and eczema also causes excessive dryness of the skin. A person with a family history of scalp acne or undergoing psychological stress may also be at greater risk. Acne on any part of the body is not caused by oily foods or chocolate. Folliculitis is an infection of the hair follicles mainly with bacteria. Staphylococcus aureus is the most common bacteria that causes folliculitis. It is more likely to occur in a person who shaves the hair on the head and communal bathing like in hot tubs hence the common name hot tub folliculitis. An uncommon type of folliculitis known as folliculitis keloidalis occurs at the back of the head and on the nape of the neck mainly in men of African ethnicity. Folliculitis appears as small white to yellow pus-filled pimples which initially starts as tiny red eruptions. If the condition is severe and left untreated for long periods of time, it can lead to significant scarring. 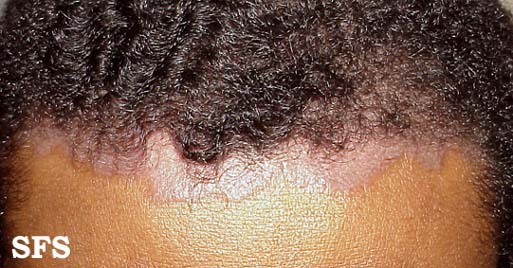 Keloid scarring is seen with folliculitis keloidalis. Picture of folliculitis (above) and folliculitis keloidalis (below) from Dermatology Atlas : Courtesy Samuel Freire da Silva, M.D. Psoriasis is a skin condition where the cells rapidly grow causing thickened plaques of dry, scaly skin. It can occur anywhere on the body. Although the exact cause is unknown, it is believed that scalp psoriasis is due to the immune cells targeting the skin. Psoriasis is a chronic condition that goes into periods of remission but recurs thereafter within months or years. 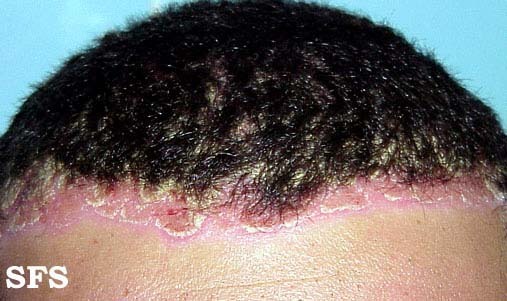 Picture of scalp psoriasis from Dermatology Atlas : Courtesy Samuel Freire da Silva, M.D. 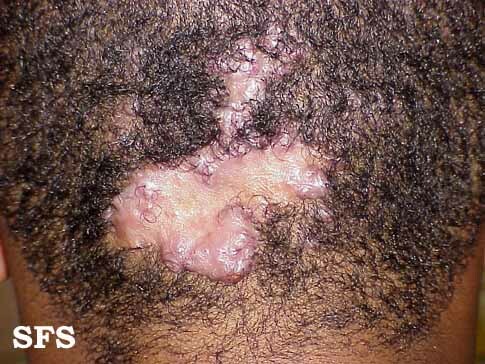 Scalp ringworm is a fungal infection of the scalp. One type of fungi known as dermatophytes causes a round ring-like rash hence the term ringworm. 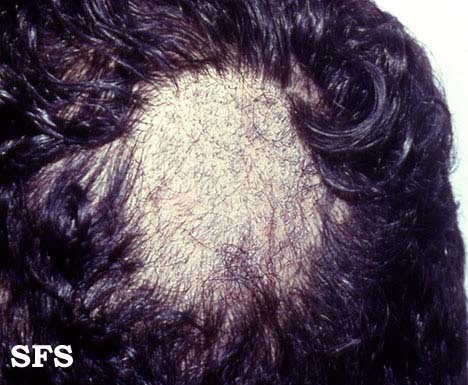 This type of fungal infection on the scalp is known as tinea capitis. Other types of fungi known as yeasts also cause a ringworm infection of the scalp. One of the common species of yeast that infects the scalp is Pityosporum ovale (Malassezia furfur) which is the main cause of dandruff. Picture of scalp ringworm from Dermatology Atlas : Courtesy Samuel Freire da Silva, M.D. Head lice are a type of parasite known as Pediculus humanus capitis that infests the human scalp. It is sometimes commonly referred to as nits and lice, since the eggs of these lice are known as nits. 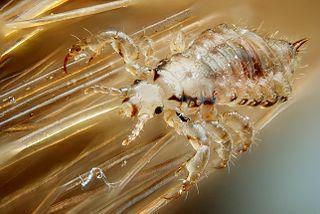 Head lice closely related to body lice and pubic lice. These types of infestations are more common in children as the lice tends to spread aggressively within day care centers and schools. It causes intense itching and a tickling sensation on the scalp. The rash that head lice causes appears as reddish bumps and sores on the scalp. Seborrheic dermatitis is an inflammatory skin disease of the oily areas of the body. The skin becomes scaly and greasy and eventually peels away to expose the underlying reddish skin. The exact cause of seborrheic dermatitis has not been conclusively identified but it is believed to be an immune mediated reaction to the presence of the normal skin flora – bacteria and fungi that live on the skin without causing any disease. The condition is also marked by excessive skin oil (sebum) production. Seborrheic dermatitis is a common cause of dandruff in both children and adults. Another form of seborrheic dermatitis that is seen on the scalp of newborns where it is known as cradle cap. Picture of seborrheic dermatitis from Dermatology Atlas : Courtesy Samuel Freire da Silva, M.D. Washing the hair daily or at least every second day. Using mild shampoos and conditioners. Baby shampoo is one of the mildest shampoos that are easily available. Avoiding hair care products or at least minimizing its use and opting for milder variants. Hair dyes are among the harshest of these products and may have to be discontinued altogether. Covering the scalp with scarves and hats can cause and exacerbate certain conditions and should not be worn on a daily basis. Other skin diseases need to be treated appropriately and may involve the use of medicated shampoos, creams and ointments or oral medication. This may vary depending on the underlying condition.